In The Meyerowitz Stories (New and Selected), Noah Baumbach successfully captures the inner workings of family dysfunction. A strained long-distance relationship between two brothers with segregated childhoods. A father’s fear of letting his daughter venture out into the world alone. A step-mother’s disdain at feeling like an outsider from the family. Most importantly, the failings of a father, and the effect this has had on his middle-aged children. Shrewdly observed and portrayed with subtlety, suppressed emotions are expressed through greetings, subdued facial expressions, and words left unspoken. But no progress can be made until words are spoken and connections are rekindled, and the Meyerowitz family begin this process in the wake of a health scare. While there are many perceptive family stereotypes that will be recognisable in some form to the majority of viewers, Baumbach by no means falls into the trappings of stereotyping, constructing personalities and relationships with unique and particular dynamics and quirks that distinguish them as complex characters. A toxic personality sits atop this family tree in the form of Harold Meyerowitz (Dustin Hoffman), a questionably talented sculptor who is bitter at the art world for never giving him the amount of praise and success his peers achieved. Harold is never a completely detestable man, and is often very funny, but he is gradually revealed to be incredibly selfish and a poisonous figure in his children’s lives, despite all of this being unbeknownst to him. 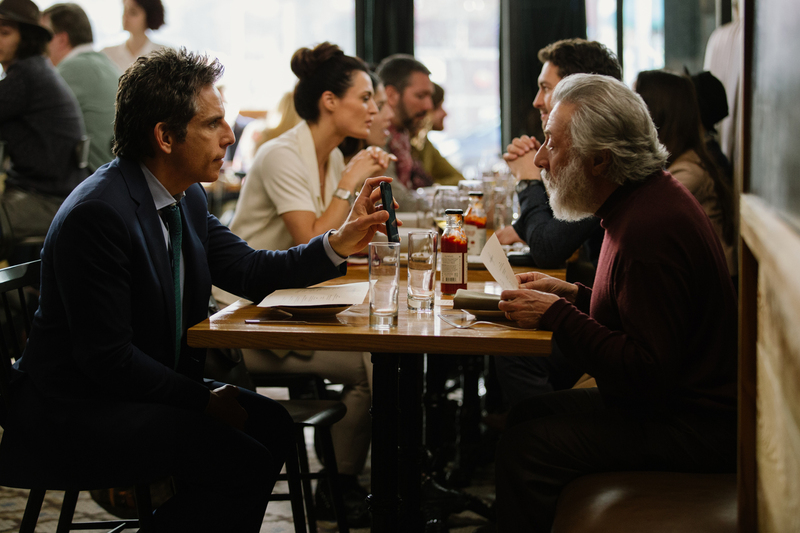 Of his three children, favouritism comes into play with successful accountant Matthew (Ben Stiller), him being the only one to receive any sort of affection from his father. Jobless and with divorce on the horizon, Danny (Adam Sandler) is considered a major disappointment, having been considered Harold’s creative heir on account of impressive musical talent as a young child, and emotionally damaged Jean (Elizabeth Marvel) is scarcely even acknowledged. Adam Sandler is revelatory here as Danny, performing with the nuance and intelligence of a seasoned dramatic actor in what could be his finest performance to date. Despite his filmography consisting mostly of throwaway, cash-grab comedies, Sandler puts this background to good use, with impeccable comedic timing and a general likability that not many can exude with such ease. Danny is the closest thing to a lead character here, and his individual story is the most interesting. An exciting time for his teenage daughter signals a seismic change in his life; he and his wife have agreed to divorce when Eliza (Grace Van Patten) leaves for college, so Danny is about to lose both of the women he loves. Before she leaves, impressive newcomer Van Patten and Sandler share some screen time, and have great chemistry as a father and daughter that come off more as best friends. This extended opening sequence of the two together is just enough for us to warm up to the pair, so that it is meaningful enough when we watch Danny say his goodbyes to her before she is whisked away, onwards to the rest of her life. Unemployed and now homeless, Danny takes the opportunity to spend some quality time with his father, who was apparently not overly present during his youth. They seem to be enjoying themselves; they play pool, drink beer, and appear to have a fairly healthy relationship. But the real dysfunction among the family is laid bare when Danny’s half-brother Matthew enters the picture. Matthew is passing through the area and arranges to meet his dad for lunch, but the fractures are apparent when this reunion ends up being more of a business meeting, and by evening, the two men are shouting at each other in the street. When Harold ends up in hospital with a head injury, the siblings are brought together and are reluctantly forced to reconnect. The relationship between brothers Danny and Matthew is an interesting one, and one that at first glance seems hostile if anything. Having not seen each other for years, and likely never having become as close as brothers should be, their feelings toward each other range from indifference to contempt. Danny is jealous of Matthew’s success, and most of their conflict revolves around their very different relationships with Harold. But these conflicts are amended, and the pair are united through their simultaneous acceptance that their father doesn’t deserve such kindness from his neglected children. Sandler may outshine Stiller throughout, but a phenomenal and completely believable moment occurs when Stiller breaks down at his father’s gallery show, in front of a crowd of strangers to whom all this family drama is completely irrelevant. Hoffman’s performance, however, is a bit one-note and becomes wearisome towards the end of the picture, with little room in the screenplay for him to deliver emotionally. As sister Jean and step-mother Maureen respectively, Elizabeth Marvel and Emma Thompson act as amusing supporting characters, but are unfortunately underused despite shining in the few scenes they’re in. It may sound as though this narrative is sad and serious, but it’s not all doom and gloom. 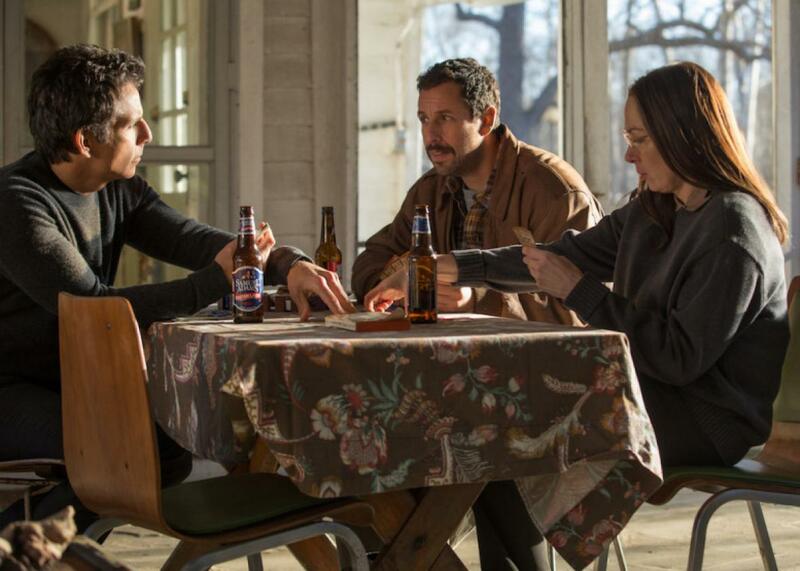 In fact, The Meyerowitz Stories is one of the year’s best comedies, helped out by its cast and the familiar style of Baumbach’s writing. Tackling big and serious issues while drawing laughs, the movie is full of notably hysterical moments while never making light of the film’s darker themes. From Sandler and Stiller smashing an elderly man’s car, to Hoffman causing a lengthy ordeal over a jacket mix-up, Baumbach combines verbal and visual humour along with wry cinematography and editing to construct hilarious and memorable sequences, allowing the story to tell itself in a series of standout moments rather than meandering from scene to scene. Harold’s incompetent parenting may have caused his children pain and emotional damage, but at least he serves as an example of what not to be. Danny’s close relationship with his daughter is a result of not wanting her to be like he was: effectively fatherless. At times, he may be overprotective through fear as he questions whether he is doing enough as a father, but all in all, Harold’s shortcomings have prevented Danny from making the same mistakes. Matthew also has a young child, and due to being a workaholic, his only form of communication with his son is through a webcam. 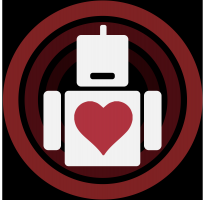 But by the end, after realizing the effects that Harold has had over him and his siblings, he commits to dedicating more time to raising his son. With all things considered, it is safe to conclude that Harold is a poor father, and that his sons treat him with far too much respect and commitment. But the two brothers find that when the anger and disappointment in their father subsides, what’s left is pity and acceptance. With Harold likely nearing the end of his life, the siblings know that he isn’t going to change and opt to become better people than their father ever was. They take their stand, and refuse to vie for his approval any longer, but when all is said and done, the events of the film have brought an estranged group of people closer together. Despite accepting that they will never get closer to their father, the Meyerowitzes finally feel like a family.